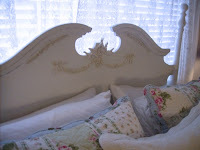 My Romantic Home: The Bedroom Makeover! The wall color is showing up brighter and darker blue than it really is. I painted it this color a couple years ago and I think I'm going to go a little lighter sometime soon. My parents bought this bedroom set for my sister in the 1960s. 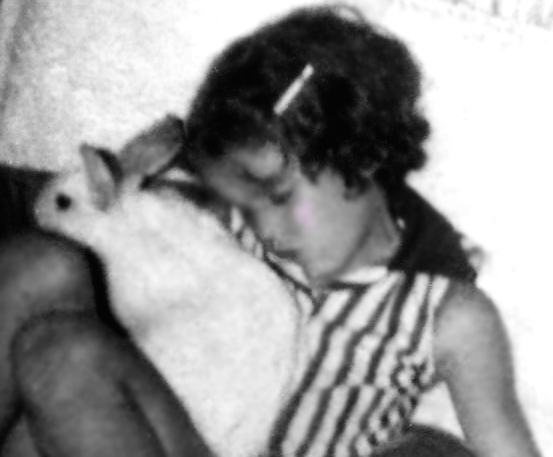 When I moved out of their house in 1979 I took it with me and it's been my bedroom set since then. It was in horrible shape but I couldn't afford to get a new one so I decided to paint it. This is something I have wanted to do for years. These are the mirrored closet doors. The lace panels don't match...I'm still on the hunt for 4 nice panels (2 for the closet and 2 for the window) at a good price. I was surprised when I stripped the mirror and found out it wasn't really wood, it's molded plastic with a woodgrain imprint in it. I added the rose appliques. This shelf was made by my dad. I still need to decorate it better. For now I just threw some things up there but everything is the same height so it looks messy. The little white slip was mine, it's a size 2T. The little white Stride-Rite shoes belonged to my kids. My son painted the picture on canvas of the grapes when he was around 9 years old. The queen size headboard I found for free on Craigslist. I added the cherub and rose swags. I wish I had the lady's email address who I got the bed from, I would love to show her what I did. You can't see it in the before shot but it had initials carved into the wood. I still need to make the lampshade covers and paint one of the lamp bases. I still haven't taken my sewing machine to the shop because I just know it's going to cost me at least $100 to fix it. I fell in love with this quilt which I bought from Summer's Cottage. She has beautiful things. I also have her link on my sidebar. Sometimes I go to her Ebay store just to window shop...pure beauty! This is the sign I ordered that I'm patiently waiting for. I first saw it on Flickr and then saw she had a website and it was for sale. It was a $100, which was out of my budget. I loved it so much that I kept going back to her website to see if anyone bought it. When I saw she reduced the price to $50 (which was still out of my budget), something came over me and next thing I know, I'm on Paypal buying it! I sure hope I get it soon! It's been about a month since I ordered it. Your room is beautiful Cindy! And the part I like best is that it's a rental done on a tight budget. That's so much more realistic than other makeovers that cost thousands of dollars in a 3500 square foot house! Thanks for the inspiration! I knew I'd be impressed, but WOW! This makeover is dramatically beautiful! I just love all the little touches, and I especially love you did it for yourself, you did it with makeovers and paint, and you did it in BLUE!!!! I just love everything. I think I could just dream away my cares and worries in a little feathered nest like this. I'm really happy for you! 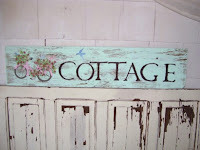 I hope you get your pretty cottage sign soon! Cindy, it's absolutely beautiful. I think this will be an inspiration for many. 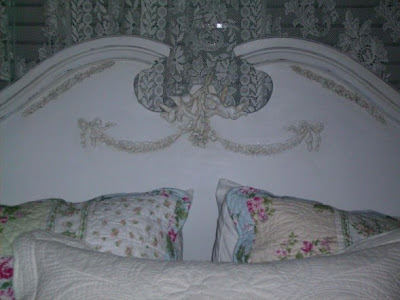 The headboard is my most favorite I think. I helped a newly single friend redo her bedroom. I did it in these colors--walls and linens. I wanted to paint her furniture in the worst way! Congratulations.....you will enjoy this for a long time to come. Pure cottage romance! 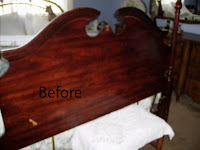 You did an awesome job - I love the touches on your headboard especially. Congrats and sweet dreams! oh, Cindy, just beautiful!! 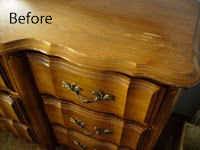 I love all the before shots, it shows us the hard work that you did. The paint job is terrific on the furniture. 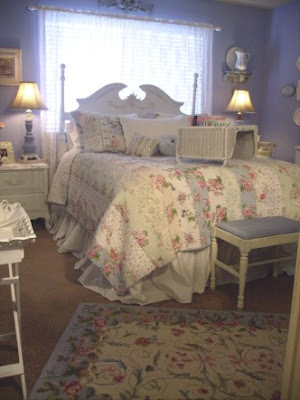 I love it - it looks like an adorable room from a favorite b&b. Nice job! Oh Cindy, that is absolutely beautiful! I especially love your bed makeover, but all of it is just to die for! You are so inspiring! It's beautiful, Cindy! I can't believe what a great job you did with that bed! It's amazing. And inspiring. AREN'T YOU THE ONE! That is bee-utiful! I love it. 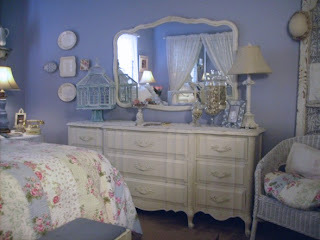 I love that old bedroom set! It all looks very, very pretty and yummy to jump into on a warm spring evening with a pile of magazines or a good movie (fresh outta the bath, of course!)! Mmmmm! Blessings! As my daugher would say "You Rock!" What a beautiful makeover. 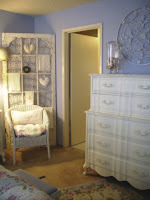 I love the before and afer shots, I love that you did it yourself, I love the romantic appliques you added, and putting those lace panels over your mirrored closet doors in ingenious! Gosh, I hope you get your sign soon. A month is a long time to wait. Maybe she's painting a new one for you? Your bedroom is simply beautiful. You did an amazing job on a budget of making a truly "romantic" and beautiful room that any women would love to move into. I love your Cottage Sign too. Sometimes, we have to treat ourselves with something special and your sign will look great. After all, you saved a bundle with your makeovers. It's just lovely, Cindy. You've really put a lot of thought & care into putting it all together & it shows! 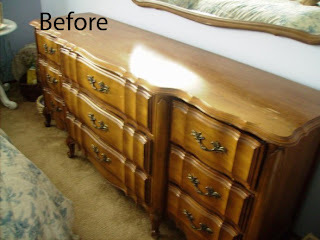 Love the bed makeover, as well as painting the dresser white. You've really accomplished the shabby chic look with flair. 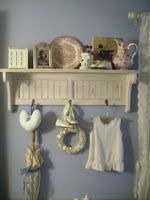 What a great shelf your dad made too...I know you must cherish that. 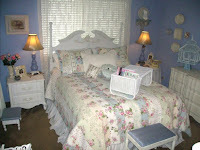 Cindy you have done such a beautiful job on your bedroom. I love checking out all of your new projects! Keep them coming! How pretty! I'm so happy I stopped by tonight and found that you had posted pictures. It's great that you took before pictures, or you would forget what you started with after spending time in such a relaxing room. I know this was a ton of work! But it sure payed off. I love the Cottage sign! I can see why you just had to have it. What is the name of the website where you ordered it? I would love to see what else she has. Thanks for sharing your pictures! Your room is beautiful and that bed is simply stunning. I love your decorating style and always look forward to seeing your pictures. Your blog brings a lift to my day! Well I requested you continue wowing us and you certainly did!! 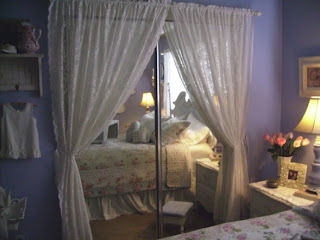 Cindy your bedroom should be in Romantic Homes or some such top decorating mag., it's just fabulous. What you've done with the furniture alone, painting and adding the bas relief elements, is gorgeous. What a huge job painting all those large pieces - I feel inspired now to get to my old sewing machine table which I'm planning to paint and use as a nightstand! Absolutely Stunning, what a transformation! I love your bedroom. I'm sure my husband would never let me do something so pretty and feminine. It is beautiful, romantic, awesome, perfect, so impressive, there are not words to describe it. What a wonderful place to sleep. Cindy,this is just so beautiful! 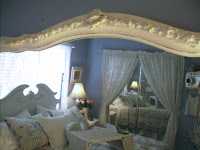 I really loved seeing this room.... soothing and just so pretty to see. Job well done!! Your bedroom is beautiful! Thanks for sharing such an inspiring blog. Oh, and that sign! I was admiring that on Flickr (especially love the little bluebird on it)..... so happy for you that you got it -- or rather that you are GOING to get it! Hope it arrives soon!! Everything is sooo beautiful; I'm always empressed by creative people and all the time that goes into these projects. You should be so proud of yourself for a job well done! wow.wow.wow. you go girl... absolutely fabulous...we need to nominate you for hgtv ! Pretty! I'm a fan of blue myself. You have created a beautiful sanctuary. 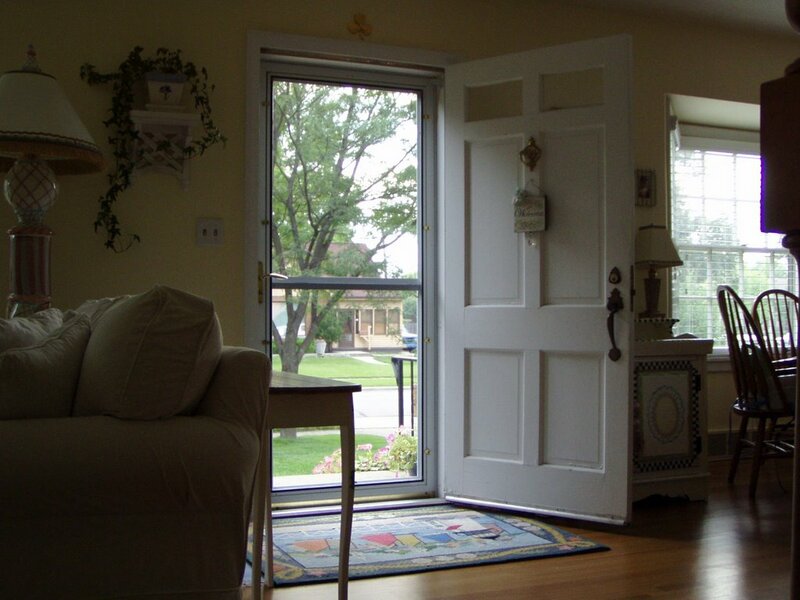 It is romantic, calming, soothing, cottagey, cozy and a lovely reflection of you. Such a lovely room, I have been day dreaming about lavander, it looks beautiful in your room. Makes me want to try it somewhere in my own home! Your bedroom turned out amazing...you should be so proud of what you accomplished! Hi Here I am! Thank You ladies for the lovely comments on the sign! they have inspired me which I needed in this gloomy weather we are having. My computer crashed in Feb.! Then I suddenly had a horrible lung infection,I sounded like I was smoking 5 packs a day! The high powered antibiotics wiped me out too.The universe has a strange way of saying stop! I just got back online today and emailed Cindy two times today to thank her and apologize for the inconvenience.I have more signs to paint now that I can breath again.Is the sun shining in California? We are at the tail end of a Nor'easter out here on Gilligan's Island.NE does have its romantic charm but there are minuses just like everywhere.My webdesigner A.D. Regan from Australia was making a website for me using the pink bike image...Gorgeous and darling to say the least!Ali is very talented and reasonable. Hi I also found a chippy pink hutch being thrown out on the side of the road here where I live To Die For! I could not believe my eyes! I will take a pic whenever the sun comes out again. It's so strange.. I came across your blog when I was redoing my dining room and kept thinking I can't wait to see how her room turns out (all the while, wishing I could speed up the process in my own room!). Yours turned out beautiful...it's amazing what a difference it can make. I've finally finished my Dining Room and felt inspired to start my own blog after seeing yours, and so many other talented people out there. 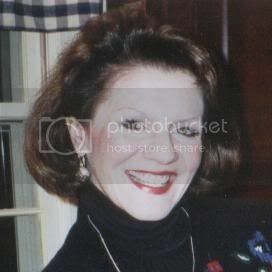 Stop by and take a look when you get a chance...I'd love to receive your feedback! Wow, you have given me such inspiration. I have been doing the same stuff with furniture I have found on CL. It's great when you are on a budget like myself. I am finding it to be lots of work but now after seeing what you have done, there is hope! You put so much love into your home. Thank you so much for sharing! Hello, my name is Tania. I'm from Brazil and researching romantic rooms, found your blog. We live in a small apartment and is our first home! 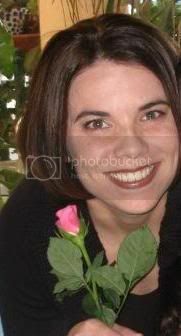 I saw a store in a fabric with white and blue stripes and lots of roses, beautiful thought and bought. But I do not know what to use as a screen and do some pillows, or if I make a skirt for the bed liner and a chair. Anyway, I'll inspire me in this world of beautiful things. How lovely! Thank you for sharing your wonderful home and your techniques. You've probably already found your lace curtains, given the late date of this note, but if not--check Ikea -- they have some decent lace curtains for $14 per pair. Cindy, your room is awesome and so romantic. It reminds me of my first bedroom I got to decorated all by myself, same color scheme. Unfortunately, our burned down and the pics were lost. 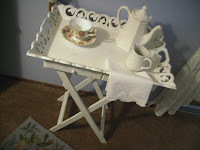 You can find a description of it on my blog: beezrentaldesigns.blogspot and see some of the familiarities. Looking at it made me very nostalgic for my old room as I was only 15 when I created it and was 22 and pregnant with first child when house burned. Thanks so much for the memory. I love your work. Gorgeous makeover of Bedroom. It’s looking so awesome and I adore your great job. I was looking to get a good overview of the topic and your article provided help on the way. Thanks.